President Shimon Peres will meet with Russian President Vladimir Putin in Moscow on Thursday to open the world’s largest Jewish museum. President Shimon Peres will meet with Russian President Vladimir Putin in Moscow on Thursday to open the Russian Jewish Tolerance Museum, the world’s largest Jewish museum. Russian officials said Putin also invited Peres to discuss current events in the Middle East and northern Africa. Russia's Chief Rabbi Berel Lazar also has invited former Soviet President Mikhail Gorbachev to visit the Tolerance Center. "Jews feel confident and comfortable in today's Russia. I am happy that it has become possible largely due to the political process which I began," Gorbachev was quoted by the press service for the Federation of Jewish Communities during a meeting with Lazar. Alexander Boroda, said President of the Federation of Jewish Communities of Russia, said work began in 2007 to create the museum project, which he originated along with Rabbi Lazar. The Russian Jewish Museum of Tolerance is designed to bring together different cultural traditions through the prism of Jewish culture, to develop ideas of tolerance and harmony. The center includes state-of-the art technology to teach the Creation, the Giving of the Ten Commandments on Har Sinai, the Holy Temples, life in the Diaspora and Jewish suffering throughout the generations. It will be the biggest Jewish museum in the world, with an area of 17,000 square meters, while the area of exposition dedicated to history of Jewish people is 4,500 square meter. It will house several museum expositions, a library, a scientific center, conference halls and exhibition galleries. The ground floor of the two-story educational and exhibition complex will be located underground. Boroda has said that the reawakening of Jewish life in the region has crowded Moscow’s five synagogues, and that more will be established, along with Jewish schools. 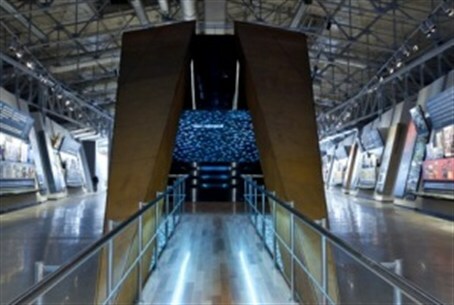 The Moscow museum is in addition to the new and large cultural center and Holocaust museum opened recently in the Ukraine. Named the "Menorah Center," it includes seven buildings and houses thousands of artifacts plus a community center, hotel, kosher restaurant, and art galleries. The seven-tower, twenty-story museum and center multiplex, cost an estimated $60 million.